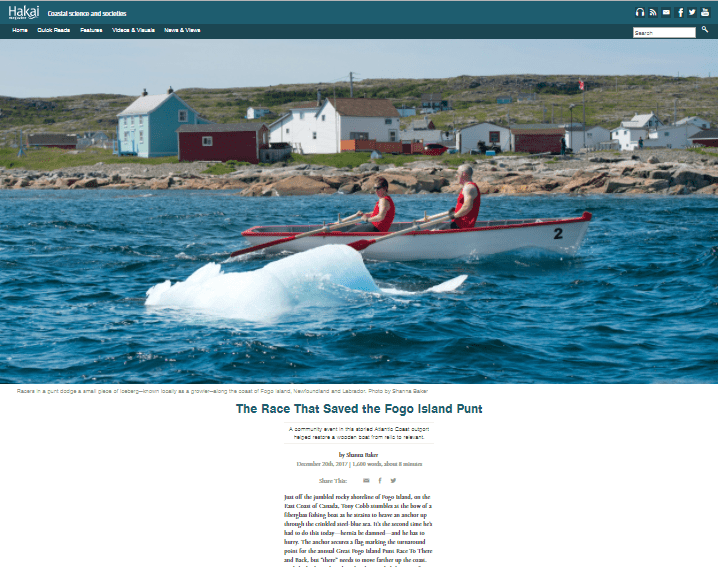 Article: The race that saved the Fogo Island punt. 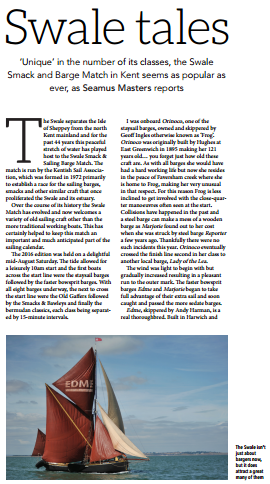 The latest edition of Classic Sailor magazine has a nice piece about last year’s Swale Match that provides a foretaste of this year’s event on the 29th July. The race is quite an event with 50 entrants in 2016. It has a staggered start at 15-minute intervals including staysail barges, followed by bowsprit barges, gaff rigged yachts under the umbrella title ‘old gaffers’, smacks and bawleys, and what are called ‘bermudan classics’. There’s even a class for traditional power vessels, though they receive awards rather than racing. The author seems to have have a very pleasant time aboard the staysail barge Orinoco, from which he seems to have admired other staysail barges such as Edme and Marjorie, Dan Tester’s gorgeous, Herreshof-built Starling Burgess 6-metre sloop Sheila and the Brightlingsea smack Alberta, which was restored some time ago by Dan and his late father Barry Tester. For photos of earlier Swale Matches, click here and here. The 2016 Swale match is this weekend! It /is/ quite a spectacle – and well worth watching from a boat afloat or from the land – the point at Oare Marshes is a good spot. 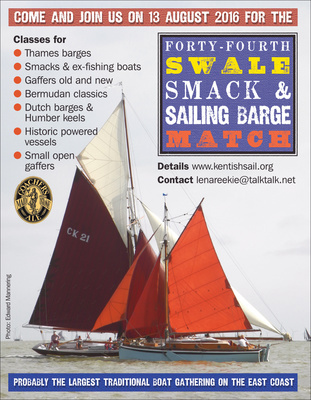 Author Gavin AtkinPosted on August 9, 2016 Categories Barges and wherries, Events, Locations, Medway, Swale and the Kent coast, Racing sailing craft, Thames Estuary and the East Coast, wooden boat, Working boatsTags racing, sailing barges, smacks, Swale Match1 Comment on The 2016 Swale match is this weekend!